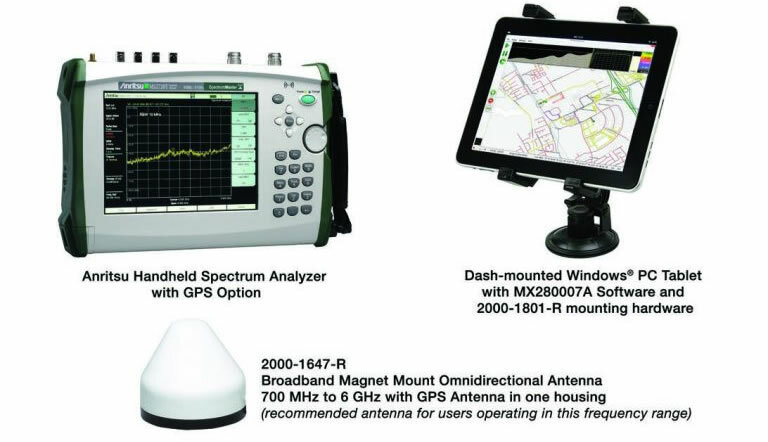 Interference Hunter software uses power-of-arrival technology to quickly measure and locate sources of interference. To guide the user to the interferer position, directional arrows are positioned on the map. The accuracy of these directions is enhanced with GPS technology to precisely identify the driver’s position and the path to follow. Additionally, voice prompts are given allowing the user to minimize the need for viewing the map while driving. This helps to facilitate one-person operation. Voice prompts can be played on the tablet itself or fed into the car speaker system with an audio cable. Bluetooth® wireless technology can also be used where both the vehicle radio and the tablet are equipped with this feature. Care must be taken to insure that Bluetooth transmissions are not in the same frequency band being searched for interference.